The Guru first experienced Nepalese cuisine a couple of years ago in St. Paul, Minnesota. Like cuisines everywhere, it has dumpling dishes – they're called mo-mos and are offered filled with ground pork or vegetables – and like many Asian cuisines, it uses its own style of curry (flavorful, but not fiery hot) in many dishes. The little storefront on the edge of Downtown is decorated with travel pictures of the Nepalese mountains. Hanging prayer flags criss-cross the establishment and soften the rather bare-bones decor by adding some pleasing color. Everest is a cafeteria at lunch, but a table-service restaurant for dinner, and the small staff, extremely knowledgeable about the offerings, is pleasant and helpful. It's also an inexpensive restaurant with a large choice of vegetarian dishes, but with chicken, lamb and pork for the more carnivorous. The kingdom of Nepal, where Kathmandu is the capital, is locked between India and China in southern Asia. It's not quite as large as Missouri, but if you take the Himalayan mountain range, through which the nation spreads, and leveled it and spread it out, it would be far larger. Nepal's dominant landmark is Mt. Everest, large enough to give the restaurant a name and have lots of its own area left over. 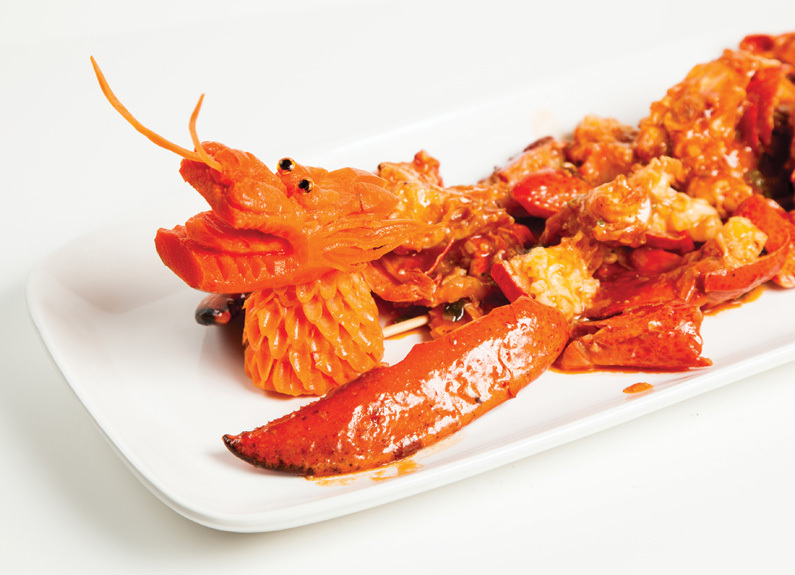 The menu is small, especially in terms of the giant menus offered at a number of Asian restaurants here in River City, but it offers a good range of fresh-cooked, tasty meals, and the freshness gives many good reasons to be patient. Just sip the delicious, slightly milky, slightly spicy chai and munch on tingly papadams, the feather-light lentil flour crisp bread that is as addictive as it is delicious. Appetizers are delightful, and it's easy to sample all four of them (a fifth is a platter offering a little of each). Mo-mos, in light dumpling skins, are offered in both styles, with ground pork or with an assortment of mixed vegetables, including spinach, onions and a starchy vegetable plus herbs and something seasonal. The meat mo-mos are slightly spicier; both are served with "achar," a slightly sharp, pickle-based relish or dipping sauce. Samosas, very similar to those in Indian restaurants, are filled with the same vegetables, but there is a definite flavor of coriander, and the pastry, light and flaky, has a hint of curry. And then there is masala bread, flavored with herbs, fried and sprinkled with a little powdered sugar, then served with a delicious, tangy sauce. Interestingly, the sugar does not bring a feeling of sweetness, but complements the other spices to add some depth to the entire dish. New and interesting and tasty. Thick lentil soup, made with yellow lentils, is a vegetarian, fat-free delight, especially warming at this time of year, and it is available by itself, or with all the platter-sized entrees, whether vegetarian, with lamb or with chicken. The boneless chunks of meat are tender and while of rather mild flavor, work well with the vegetables for a pleasant dish. The platters include stir-fried spinach, always delicious, mixed vegetables with a good hint of curry and the achar sauce. All are accompanied by nicely cooked rice with good texture. Tofu Sag Curry, or tofu, bamboo shoots and peas in a light, pleasant curry sauce, is very tasty, and the tofu can be filling, too. The peas are pleasing and add a note of color, and the various Nepalese herbs added another harmonious note. Chicken curry with green beans was tasty, and sizzling lamb arrives with bell peppers, tomatoes and red onions. Beer, soda pop and a few wines are available, but the chai, with some Nepalese spicing, was a delicious version of tea, and there's also that superb southeast Asian drink, mango lassi, or mango juice and mango pulp blended with yogurt. Cooling, delicious and filled with flavor. And save room for the homemade kheer, or rice pudding, a rich, smooth, engaging version with coconut, raisins and cardamom providing a hint of spice and a little sweetness. Dinner at Everest Café is tasty, filling and a superior bargain. A visit does mean venturing into Downtown St. Louis. There are, however, no mountains to climb.